Sure I'm exhausted and sick this week, but hey I have had a lot of stuff published including these three shots in the Philadelphian Inquirer. 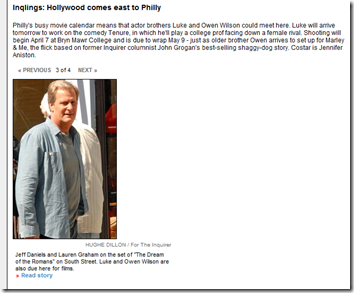 Great entertainment stories and news about movies being film in Philadelphia, including the Lauren Graham / Jeff Daniels movie, the Luke Wilson, Owen Wilson, Jennifer Anniston Movie, and the Transformer movie, really they are all going to be filmed in Philadelphia. Also information on an appearance by Julie Andrews. So check out this link and read about Phillywood events.